This project in Guildford was a full design and build project that required the use of on site material. 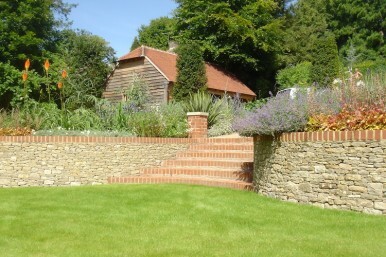 The retaining walls were constructed using all the rockery and walling stone that existed on site. Our team expertly trimmed, dress and prepared the stone prior to it being placed in the wall. Structural engineers were used and electric points and weather proof boxes were built into the wall for the garden lighting. These walls look like dry stone walls but are in fact mortared at the rear to give a structurally strong wall. A local brick that matches the house brick was used to cap the wall. These walls enhance the biodiversity on sites and gardens by providing small spaces between the stones for animals and invertebrates to live and hide!